Laser Therapy is using photons of light at certain frequencies and power to modulate cellular functions. The light from the laser stimulates photoreceptors inside the cells to produce more energy, to increase production of protein, collagen and DNA. The result of these actions inside the cells is rapid cell regeneration and healing. Lasers like the class IV laser used at Safari with longer wavelengths and higher output are able to penetrate deep inside the body to stimulate healing and to reduce pain and inflammation. Cell energy is regulated by mitochondria within the cell. Mitochondria can be considered as the “batteries” or “fuel-cell” of the cell. The packets of energy that are distributed to cell function is Adenosine triphosphate (ATP). When ATP increases, cell function, cell healing, cell respiration, and cell regeneration all increase. The mitochondria are charged up by photons of light emitted from the laser, thereby increasing ATP within the cell. Laser therapy causes the dilation of blood vessels resulting in increases in blood flow. Increased blood flow causes increased nutrients and oxygen delivered to an area, while toxic chemicals and carbon dioxide are removed. Improved lymphatic drainage, along with the increased blood flow, reduces swelling and the accumulation of tissue fluid. The combined effects reduce inflammation and improve healing. Nerves require a certain stimulus to “fire.” This stimulus threshold is usually 15 millivolts of energy, or touch, heat, cold, or pressure. Damaged tissue nerves “fire” at only 5 millivolts making them more sensitive, more irritated, more painful. 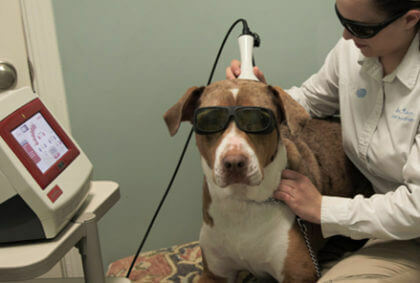 Laser therapy resets the threshold back to 15 millivolts, thereby reducing the sensitivity to pain in a damaged tissue. With Intervertebral Disc Disease (IVDD), there is damage to the spinal cord. Laser therapy to damaged spinal cords reduces degenerative changes in the nerves and helps induce healing. Myelin is an important protein that covers the nerves like insulation covers wires. Myelin production is increased by the application of therapeutic laser. Nerve associated healing cells (astrocytes, oligodendrocytes, and Schwann cells) are stimulated by laser application possibly through the release of growth factors and other proteins necessary for healing.